Indigenous women know they are already empowered; we hear how they have fought wars, (even if history has forgotten them), lead communities (even if this goes unrecognised by the state) and continue to protest inequalities (even when governments try to hoodwink them into believing they are acting in the best interests of indigenous women). Read the full text speeches from each of our panellists in the full report here. 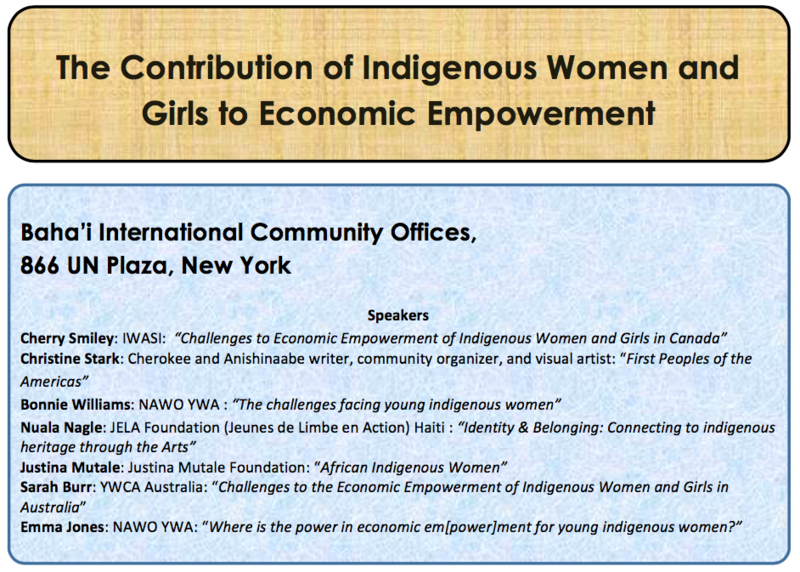 On 17th March 2017 at the 61st United Nations’ Commission on the Status of Women, NAWO held a panel event on the ‘Contribution of Indigenous Women and Girls to Economic Empowerment’. Although we are a UK member organisation, we felt that it was really important to provide a space where the voices of indigenous women could be heard. However, back in the UK it is fair to say we had a big debate about whether or not this was the right approach to take. 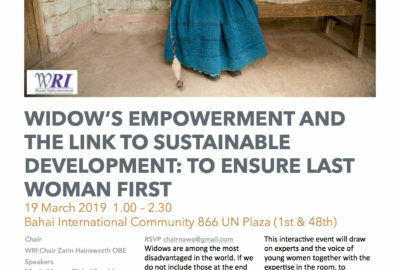 I personally reflected on the fact that I am a trustee of Widow’s Rights International (WRI), even though I am not a widow. Instead, this is a role where I act in solidarity with widows who are fighting for recognition and rights. Likewise, I am not somebody who has been exploited into prostitution, but I still work hard to enable the voices of women who have been and continue to be personally affected by this injustice. At NAWO, we came to the conclusion that it was vital that we did create a space where we can stand in solidarity with indigenous women and where their concerns could be publicly raised. It was important, therefore, that we invited a panel that could bring to life and speak from personal experiences. 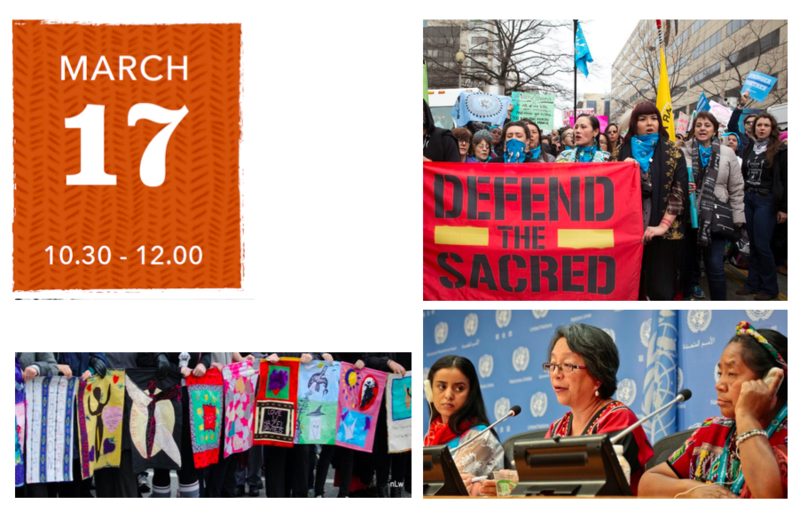 We are very privileged that Cherry Smiley – Nlaka’pamux (Thompson) and Dine’ (Navajo); Christine Stark – Anishinaabe/Cherokee; Justina Mutale – Zambia; and Sarah Burr – Wiradjuri agreed to bring their own unique indigenous perspectives to this event. We also welcome, Nuala Nagle who discusses her work with indigenous communities in Haiti and Bonnie Williams who brings a youth perspective to the issue. The panel concludes with some thoughts from Emma Jones who asks some philosophical questions about the meaning of empowerment for indigenous women and girls. The speeches in this report provide rich resource of information, data and experiences about indigenous women and economic empowerment. Perhaps most striking are the consistencies between the references to the legacies of colonialism on the lived experiences of contemporary indigenous women, irrespective of where they may be in the world. For all of our indigenous speakers, the fundamental issue of access to traditional lands and land rights rings loud and clear. This is an issue that connects spirituality and community and lays the grounds for sustainable economic, social and political empowerment. Colonialism is significant to this issue in both direct and indirect ways: Directly, the seizing of land and its associated ‘wealth’ of resources by violence meant, and continues to mean, that indigenous communities are dispossessed of their birth right. As our speakers so eloquently trace, this dispossession leads to a number of issues, including homelessness and its intersecting injustices. Perhaps less directly but just as significantly, the legacy of colonialism has also painted indigenous people as ‘others’ who are somehow less than their European-settler counterparts. These are ideas we see reflected today in the designating of all indigenous children as ‘special needs’ in Dakota, and the imposition of top-down policies that ‘do to’ rather than ‘work with’ Aboriginal communities in Australia. A second common theme that emerges from this panel is the intersection of colonialism with Capitalist economic systems. We are presented with numerous examples of the ways this plays out in the construction of indigenous women as an inferior dehumanised others. Through this lens, we are able to see how women may become commodified and subsequently prostituted and/or trafficked. The disproportionate numbers of indigenous women in these industries is evidence of these links. While there is plenty to be concerned about, these injustices and challenges have also shone a light on the indigenous women who have historically confronted these systems and who continue to challenge them today. The women on our panel bring a sense of history to this struggle for economic empowerment, which grounds itself not in individual aspirations for greater wealth and success but in the fight against patriarchy and structures of oppression which affect women at a community, tribe and at an international level. In their articulations of empowerment from an indigenous perspective, our panellists challenge the increasingly prevalent neoliberal ideas of what it means to be an empowered woman or girl in the world. Indigenous women know they are already empowered; we hear how they have fought wars, (even if history has forgotten them), lead communities (even if this goes unrecognised by the state) and continue to protest inequalities (even when governments try to hood- wink them into believing they are acting in the best interests of indigenous women). Before we ask how to contribute to the economic empowerment of indigenous women, we first have to ask how we might be denying their empowerment. Our panellists are clear that a deficit approach to empowerment, which assumes indigenous women to be disempowered, has the potential to become an additional violence. It has been said empowerment is not a zero-sum game, and that one group gaining empowerment does not mean that another must become disempowered. However, as this panel has shown, structural inequalities in the form of colonialism, patriarchy or neoliberalism, have very real disempowering effects for indigenous women and girls. Changing these structures will require shifts in power dynamics that implicate all of us who work with, and on behalf of, women around the world. Please do take the time to read the full text speeches from each of our panellists in the report here.